For several millennia most of the civilisations of Anatolia used inscription on stone to preserve important texts – whether public documents or private commemorations. While this procedure is found in many civilisations across the world, the particular wealth of Anatolia in high-quality stones and marbles has ensured an exceptionally rich harvest of texts. Over the last couple of centuries, work on these documents has helped us understand more and more of this deep and multi-layered historical heritage, constantly developing and enriching our understanding. The aim of the Symposium is to allow experts who work on the inscribed texts of different cultures to present their work and compare their experiences, building a sense of the history of the epigraphic discipline. 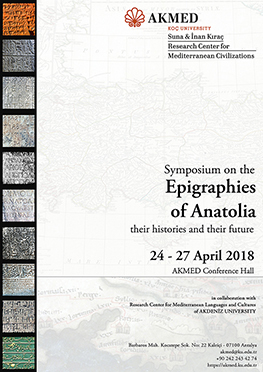 During the symposium we intend to look at how earlier generations have interacted with such texts, tracing the steady development of methodologies; at how inscribed texts have introduced us to languages which had been unread for several millennia; and at how we can teach the necessary skills, and find ways to offer the fullest possible access, both in and beyond Turkey, to this unique store of knowledge.